New Tech Network and the Buck Institute for Education boast thousands of participating teachers. Was I the only one who couldn't get it right? Proponents of project based learning argue that it can bridge the domestic and global achievement gaps, as well as meet the new demands of 21st century learners. What teacher doesn't want that for their students? However, my own early experiences with PBL were so rife with new language, approaches, and end-goals that it was easy to lose sight of the progress my students needed to be making in their ELA standards. For every small victory in developing an authentic product or audience, growing questions tugged at my teacher brain: How do I address basic writing skills? Where does close reading fit in? How can reading and writing be collaborative and rigorous? How do I manage my fullest and neediest classes? To put it shortly, the closer I got to "project", the further I drifted from "learning". Rather than ignore the problem on the back burner, I used my action research to bring it to the forefront. Surely if I looked my own pedagogical shortcomings square in the face, I could figure out where I was going wrong. I took a Common Core-aligned unit from a textbook my team was piloting, and modified it into a PBL unit. And it was anticlimactic. I learned that: a) technology is engaging, b) close reads are effective, c) scaffolding is crucial, and d) reading grew students' knowledge base. These were principles any Language Arts teacher worth their salt could have told me beforehand. My sum contribution of new knowledge to the field: zero. My action research proved to me what experts such as Fisher & Frey have been saying for years. Close reads are a must! Maybe not all the time, but certainly when the reading is important. And scaffolding? Every PBL planning guide says you need it. However, I saw through my action research that, given the heft of students' independent work in PBL, scaffolding needs to be in place for writing assignments as well as time management. As with all scaffolds, some students need a little; some students need much more. In the end, I concluded that the parts of my PBL unit that aligned closely with a CCSS textbooks yielded student gains for the standards. And the parts where the pendulum swung closer to "project" sometimes helped students build soft skills. But nothing was solved. And then I met Michael McDowell. It was a drizzly January day of PD for my school's Language Arts teachers. We were told that This Guy was going to "blow our minds" and totally reshape the way we thought about PBL. High praise. And dare I say, well deserved. 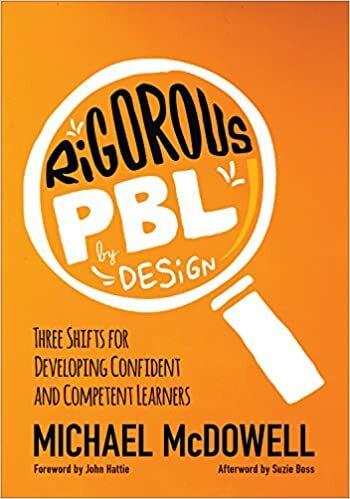 On the eve of publishing his book, Rigorous PBL by Design, McDowell began offering PD for teachers to exercise the findings he published in his book. Here's the short version: PBL has detrimental effects on teaching basic knowledge. But for teaching deep, transferable understanding, PBL is a powerhouse. Moreover, if students can't decontextualize their learning, they aren't able to apply it to anything else outside their project. So instead of telling students, "We're making a cartoon," teachers and students need to say, "We're learning how to tell stories with captivating dialogue and appropriate conclusions. And we'll use cartoons to do it." There's more, and it's really really good. The subsequent months saw my classroom transformed. My teaching partners and I began small, and with each new unit we shifted our structure a bit more to resemble the model we learned from McDowell. We were still doing projects (ones that students liked! ), but close reads and notetaking were present as well. Better yet, we grew confident in knowing when and why to rely on those more "traditional" teaching methods as a part of building the basic knowledge necessary for the project. (Thanks to tech tools I discovered through Touro, many of those foundation-building activities were "flipped" with great success.) I also made targeted, standards-based peer feedback a central part of our process. My action research began in September, but it wasn't until June that the pieces came together into something I felt confident about sharing with other educators. BIE founder claims little conflict with simultaneous PBL and CCSS. Excerpt from my research paper. Read my blog for a week-by-week record of my journey. McDowell worked closely with John Hattie; click on the link above for more Visible Learning information. A difficulty with PBL. Excerpt from my research paper. Michael McDowell's book echoed my research and took it further to application. Click on the link above for more information.